Directions (1-5): You are to choose from the given words below the two sentences, the word which has the same meaning and can be used in the same context as the BOLD part in both the sentences. (ii) The advocate wrote up an agreement for the partners. Pulled means to exert force on (someone or something) so as to cause movement towards oneself. Wrote up means a written account, in particular a newspaper article giving an opinion or review of an event, performance, or product. Thus, they both can be substituted with “drew”. Q2. (i) Alok was the first suspect in that case. (ii) The driver decided to tune the engine before going to sleep that day. Prime means of first importance; main. However prime also means make (something) ready for use or action, in particular. Therefore, it can be substituted in place of the given phrase in bold. Q3. (i) Sam’s ready wit often got him out of tight spots. (ii) The tasks they did was so different that the difference was apparent. Sharp means having or showing speed of perception, comprehension, or response. Moreover, sharp also means (of an action or change) sudden and marked. Therefore, ‘sharp’ can be used to replace both the bolden phrases in the sentences. Q4. (i) A special team of observers had been dispatched to appraise the situation. (ii) Can you estimate the distance between the two sides of the river? Gauge means judge or assess (a situation, mood, etc.). It also means the thickness, size, or capacity of something, especially as a standard measure, in particular. Thus it can be used interchangeably with phrases given in bold. Q5. (i) Repeated denial and criticism of a child makes him stubborn. (ii) Because of unyielding approach of union leaders no agreement could be reached. Adamant means refusing to be persuaded or to change one's mind. Thus, it can be substituted in place of the phrases given in bold. Eight friends A, B, C, D, E, G, H and J live on eight different floors of a building but not necessarily in the same order. The lowermost floor of the building is numbered 1 and the topmost floor of the building is numbered 8. The DOB of each of the persons falls in different months i.e. March, April, May, June, July, August, September and October, but not necessarily in the same order. All persons like different types of fruits i.e. Guava, Apple, Grapes, Mango, Banana, Pineapple, Litchi and Orange but not necessarily in the same order. The one whose DOB is in August does not live on an odd-numbered floor and does not like Apple & Litchi. J lives just below the one whose DOB is in October. The one who lives on Third floor likes Guava. The one whose DOB is in April lives on an even-numbered floor but not on the topmost floor and likes either Orange or Pineapple. Only one person lives between G and the one whose DOB is in July. The one who likes Banana lives immediate above the floor in which J lives. E likes Litchi. The one whose DOB is in June lives on an even numbered floor and lives just above the person whose DOB is in October. C’s DOB is not in July or October. The persons (who likes Apple, Mango, Orange and Grapes) lives on even numbered floor. The one who likes Grapes lives below the one who likes Mango. Only two persons live between the one whose DOB is in August and the one whose DOB is in March. D’s DOB is not in September. 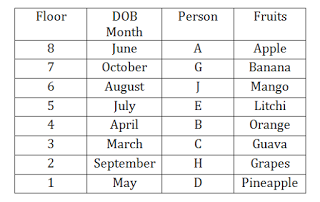 Only two persons live between G and the one whose DOB is in April. Neither E nor C lives on the first floor. Only one person lives between C and the one whose DOB is in May. A lives just above G. Only two persons live between E and A. The one whose DOB is in July does not live on floor number one. A does not like Grapes or Mango. B lives on an even-numbered floor and just above C.
Q6.How many persons live between the person whose DOB is in September and the one who likes Apple? Q7. Which of the following fruits does D like? Q8. Four of the following five are alike in a certain way and hence form a group. Which one of the following does not belong to that group? Q9. Which of the following statement is true? B’s DOB is in April and lives on the 5th floor. H’s DOB is in May and lives on the first floor. The one whose DOB is in October lives on the 6th floor. E lives on floor numbered five and likes Litchi. G lives on floor numbered seven and likes Mango. Q10. J is related to Orange in the same way as G is related to Litchi. Which of the following is B related to, following the same pattern?